After 10 seasons wearing Kansas City Royals blue, Dan Quisenberry was startled when he slipped on his jersey, walked by a mirror and glimpsed how he looked in St. Louis Cardinals red. The Cardinals colors soon looked good to Quisenberry. In July 1988, Quisenberry signed with St. Louis a week after he was released by the Royals. His departure from Kansas City was emotional for Quisenberry, who earned 238 saves for the Royals. Quisenberry, who threw a sinker with a submarine delivery, was the closer on the Royals’ World Series championship team in 1985 and led the American League in saves five times. In 1986, Quisenberry was signed to what the Royals called a lifetime contract. By 1988, the Royals were phasing out Quisenberry, 35, and grooming younger pitchers such as Steve Farr and Jeff Montgomery for the closer job. When Quisenberry was released on July 3, 1988, he was 0-1 with a 3.55 ERA in 20 games that season. Cardinals manager Whitey Herzog had been the Royals’ manager in 1979, Quisenberry’s rookie season with Kansas City. Herzog and Cardinals general manager Dal Maxvill reached out to Quisenberry and signed him on July 14, 1988. Quisenberry also was a friend of Cardinals coach Nick Leyva. They were college baseball teammates at La Verne in California. Pitching primarily in middle relief, Quisenberry was 2-0 with a 6.16 ERA in 33 games for the 1988 Cardinals. 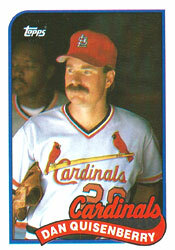 St. Louis brought him back in 1989 and Quisenberry was 3-1 with six saves and a 2.64 ERA in 63 appearances. Players in the Cardinals’ dugout “went into hysterics” after Quisenberry reached first base, the Post-Dispatch reported. Cardinals fans gave Quisenberry a standing ovation as he stood on first. In the eighth, Quisenberry batted against Ricky Horton and struck out on three breaking pitches.